I told you about my mom’s birthday tea, but I didn’t tell you that later that night we went to see budding Country Music Star (and Dancing with the Stars Pro) Julianne Hough. My mom LOVES Dancing with the Stars and she LOVES Julianne. So, when I heard on the radio a few weeks ago that Julianne was going to be appearing at the Liberty Theater in Astoria, I just knew I had to get us tickets. And I did! So, last Friday night, eight of us went to Astoria to see Julianne. She is absolutely adorable. I never thought she was a very big thing, but in person she is tinier than ever! While we were waiting in line for the doors to open, representatives of the American Red Cross were selling raffle tickets. First prize was two seats on stage with Julianne. 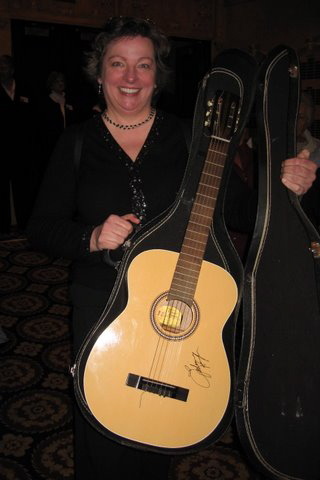 Second prize was a couple of tickets to other upcoming performances at the theater and third prize was a guitar signed by Julianne. There may have been more prizes, but my eyes were blurring over by then, so I forked over $10.00 and got ten tickets. Well, sad to say, I didn’t get to sit on the stage with Julianne. However, I DID win a guitar! Can you believe that. 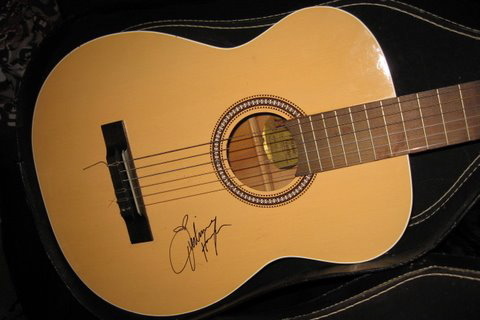 I’m not usually lucky in raffles, but I came home with a GUITAR. Now, what, may you ask, am I going to do with a guitar signed by Julianne Hough? Why, what any red blooded American would do. I’m going to put it on Ebay!